In the UK - although not anywhere else, as far as I know - February is LGBT history month. The US has its month in October. As with most years, there are no specifically "B" events although some were nearly planned. Next year, next year. There are other good things, though, which might be worth a look. There should be some bi history stuff at this year's International Conference on Bisexuality (the 10th! and held in London this time) at which I will be speaking. About.... something or other. For a long while I've been meaning to scan in this picture, which was given to me a couple of years ago. It's an illustration from a French magazine of the 1920s - possibly one called Modes Nouvelles (or new fashions) - and it's drawn by one Gerda Wegener. It's entitled "Elle ou Lui, Lequel Choisir?" which means "Her or Him, which one to choose?" 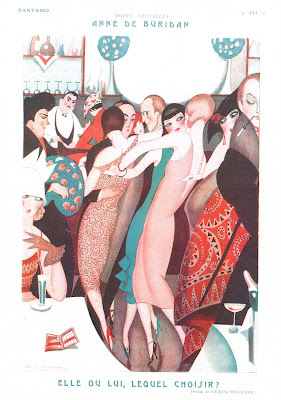 Clearly set in a mixed gender, pansexual club or cafe of some sort, in this wonderland anyone can dance with anyone, and the men look only slightly masculine and the women only slightly feminine - or vice versa. This was a time, just after the first world war horrors, where strict Victorian-style notions of gender went right out of the window, women cut their hair and shortened their skirts. Both men and women went for an androgynous look. I think it's hard for us to realise now how revolutionary that was. So, in this pic, we are left wondering who is doing the choosing? Most likely it is the be-gloved lady sipping her diabolo menthe through a straw, looking at the saucy yet ever-so-slightly dangerous man and woman on the right. But what is the woman in the green dress thinking. And, indeed, what do we think. Him or Her, which one should I choose? It doesn't really matter. Maybe one today, and the other tomorrow. Oh, Paris in the 20s. What a fabulous place to visit for a holiday.